Do you know the value of your land in Charleston? It might not be worth what you think it is! There are many potential factors that can increase or decrease the value. Learn more about the proper ways to value your Charleston land in our latest post! If you have ever tried to accurately pinpoint the value of a piece of land, you know that it can be a difficult process! There are many things that will impact the value of your land that aren’t always found with the purchase of a single family home. 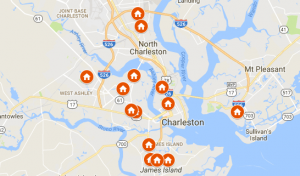 When buying or selling land in Charleston, make sure you are working with land experts such as D Gilpin Properties, who can help you determine the value of your land in Charleston or the nearby area! Income, cost, and recent sales approaches don’t usually apply to land the same way they do to residential and commercial properties. The income approach would look at how much income a piece of property can bring in. This isn’t typically applicable when talking about land. The cost approach looks at how much it would cost to rebuild. Again, not applicable here. And to look at recent sales may not be the best approach either. The land market is very small compared to the housing market. Sometimes lots are sold in bulk, acquired by investors at wholesale prices. Sometimes someone pays a fortune for a lot simply because of sentimental attachment. These kinds of situations greatly impact local averages. When trying to value your land, you will need to look at more factors than just what other lots are selling for. What Is The Current Demand Like? Take a look at how land is performing in the local market. Is it being bought up right away or is it sitting on the MLS for a while? Look at recent sales and how those lots are priced. Are there many lots available or just a few to be found? If there are lots of properties currently available, you might want to hold off on trying to sell until there are fewer available. Scarcity will help to drive up the value of your Charleston land. After all, they aren’t making it anymore! What Is The Current State of The Land? If you are dealing with raw land, the cost to run utilities to it can be very expensive. You will have a better shot at finding buyers when the utilities are already in place. There should be roads with direct access to the property. You should consider clearing the land to make it ready to build for your potential buyers. By taking care of these things before trying to sell, you will attract more buyers simply by the ease of development and the visual aesthetic you create. The best way to add value to the land is through development. Get quotes from different developers and home builders to find out how much it would take to add a structure to your lot. If you don’t want to make that kind of financial commitment, there are still a few things you can do. You can increase the value of your Charleston land by removing trees, planting some wildflowers, clearing old slabs or remnants from old structures, taking down worn fencing, and making any other improvement that will get the land ready to build. Increasing the visual appeal of the property will also generate more interest and attention when trying to sell your land in Charleston.